Unique 7 bedroom round vacation home! Great for families. Ideal location for year around enjoyment.We offer this home for rent by the week or weekend.We have a clubhouse that features a seasonal in-ground heated pool,sand volleyball court,basketball court,horseshoe pits,childrens playground,charcoal grills,picnic areas and park swings.This home overlooks a sparkling spring-fed 3 acre swimming lake with a sandy beach. 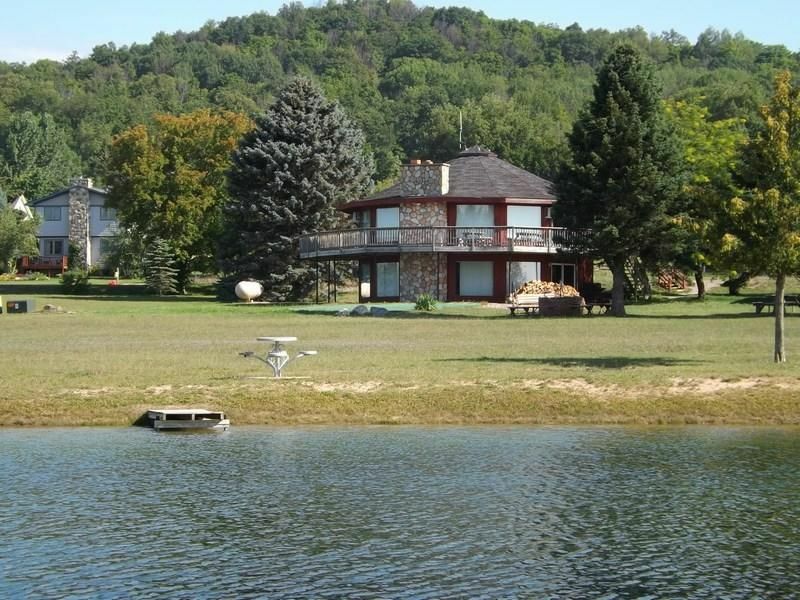 The lake is stocked with fish which is great for children.The clubhouse may be rented for private parties. Now Open, Michigan's Largest indoor waterpark, Avalanche Bay only 10 minutes away. Spring time brings the annual Morel Mushroom Festival to our area. This area is considered the finest in the state for Morel hunting.Spring time is also great for fishing in the many area lakes and streams. Summer time cannot be any more enjoyable than to stay and play in the beautiful area that we offer.Golfers can play over 30 courses within a 30 mile radius of this home. We have numerous beaches and lakes that can be enjoyed by the entire family.Great shopping,biking,boating,canoeing,sightseeing and numerous are all within minutes. Mackinac Island is less than an hours drive away.Mackinac Island is one of the great tourist attractions in the western world.It's landmark Grand Hotel has been the subject of both movies and songs. The Island has a ban on automobiles that reinforces the strong sense of history that dominates the luscious landscape. This is a must see for everyone while you stay at our home. Fall time brings a great time to visit our area. Fall color tours are considered some of the finest Michigan has to offer. Golfing in the fall can be the most enjoyable of the year with less crowds and beautiful fall views of the area landscape.Fall vacations can also be very relaxing with less crowds to deal with. Winter. We are the Midwest's favorite winter destination. are all nearby.Snowboarding,tubing and ice skating are also available nearby. Snowmobiling the hundreds of miles of groomed trails and seasonal roads can be enjoyed from the doorstep of this home.Snowmobile rentals are available.We are the Heart of Michigans snowbelt. For a great 4 season vacation location in Northern Michigan our area cannot be beat.